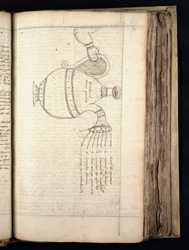 This drawing comes from a "discourse on gardeninge applied to a spirtuall understanding", a late-16th-century manuscript by Hugh Halles. It uses everyday gardening tools to illustrate the spiritual needs of the Christian soul. Good husbandry, like good governance of the kingdom, was seen to be a duty handed down from God who had given humankind dominion over all living things.